Background: The proportion of medical doctors involved in research activities is declining. Undergraduate medical research programs are positively associated with medical students' research interest. Scientific pre-university programs (SPUPs) outside the medical domain are also positively associated with research interest, but have not been related to the shortage of clinician-scientists. This study examined the effect of an SPUP on medical students' research interest. Methods: This study was conducted at a Dutch medical school. Medical students in all years who had participated in an SPUP and first-year master students who had not participated in an SPUP were invited to fill out an online survey on extracurricular activities and future career interests. SPUP participants were compared with three groups of non-participants: (i) an unmatched group, (ii) a group matched on gender and pre-university Grade Point Average (pu-GPA) and (iii) a group matched on gender and first-year GPA, one to five years after finishing the SPUP. Participants evaluated the SPUP through ratings of statements about the program. Results: Two-hundred forty medical students, including 71 SPUP participants responded to the survey. SPUP participants participated significantly more often in the Honors class (i.e., extracurricular educational program for high-performing students), gained significantly more often extracurricular research experience, enrolled significantly more often in the Research master (i.e., research training program parallel to the clinical master program) and obtained significantly more often a scholarship than unmatched non-SPUP participants. Using a non-SPUP group matched on gender and pu-GPA reduced the effect size of the significant differences in Honors class participation, Research master participation and scholarship obtainment. Using a non-SPUP group matched on gender and first-year GPA rendered the significant difference in Research master participation and scholarship obtainment insignificant. 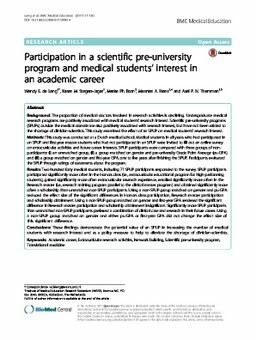 Significantly more SPUP participants than unmatched non-SPUP participants preferred a combination of clinical care and research in their future career. Using a non-SPUP group matched on gender and either pu-GPA or first-year GPA did not change the effect size of this significant difference. Conclusions: These findings demonstrate the potential value of an SPUP in increasing the number of medical students with research interest and as a policy measure to help to alleviate the shortage of clinician-scientists.